Lord Ganapati is highly venerated and is the remover of all obstacles. Any new venture or beginning is made by invoking Lord Ganapati seeking an obstacle-free path. Insurmountable obstacles magically dissipate and melt away with performing this Ganapati Homa ensuring the success and well-being. By offering obeisance to Lord Ganapati, the confidence and courage gets a boost to carry out the task to resounding success. Ganapati Homa is performed by fully qualified ‘Vedic’ specialists familiar with the nuances of ‘Vedic’ procedures and adhering to traditions. It is recommended to perform this Ganapati Homa, if you are experiencing hurdles hampering progress and seeing obstructions in your path. Ganapati Homa should be carried out early in the morning. The Poornahuti should take place at sunrise. The days of Chaturthi of every month and Vinayaka Chaturthi are considered as extremely auspicious days for Ganapati Homa. 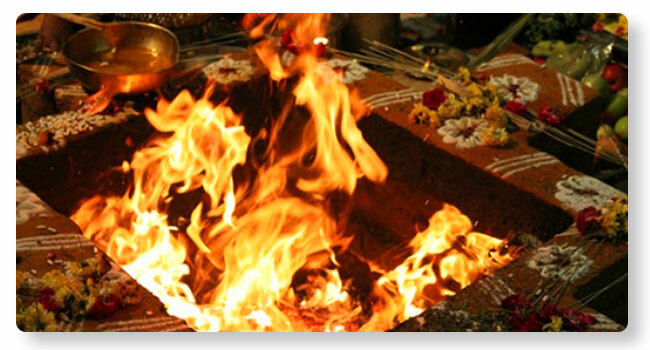 Tritiya of Navaratri is a great time to perform Ganapati Homa. Four dravyas used are modaka, durva grass dipped in ghee, popped paddy and samith dipped in ghee. This is followed by giving away prasadam and vastra and tamboolam.